At this moment I have three tarantula spiders. Two resemble the Costa Rican Tiger-Rump (Cyclosternum fasciatum) but where found in Veracruz, Mexico. It might be very well the case that Costa Rican Tiger-rump tarantulas one can buy in a pet shop are actually originally coming from Mexico. For a short wile I also had a Mexican Red-Rump (Brachypelma vagans) tarantula, but it died shortly after it made a sperm web. Male tarantulas live relatively short once they are adult so maybe it died from old age. Adult female Brachypelma vagans climbing on my hand. 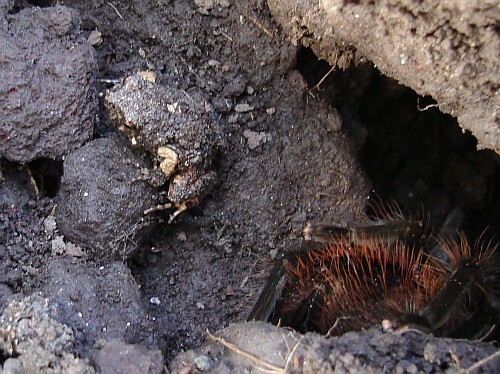 During several field trips in Veracruz I have seen the Mexican Red-Rump tarantulas living very close to the Tiger-rump look-a-like, sometimes even living together under the very same stone. To make things even more interesting, I also have seen Florida bark scorpions (Centruroides gracilis) living under the same stone, and recently even a couple of small rain frogs sharing the habitat. Rain frog species leaving the burrow of a Brachypelma vagans. 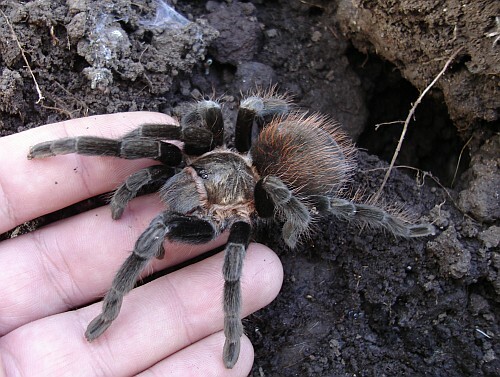 MexIT is a blog I keep, and it has several entries regarding mexican tarantula spiders, pictures and info on their habitat.